I spend a lot of my time talking to executives from some of the most iconic companies in the world. They know artificial intelligence (AI) is critical to accelerating business growth, but I’ve been struck by how every one of them is now grappling with how to implement it in their business processes. AI isn’t well suited to perform all tasks, so the challenge is to find ways to optimize the interface between humans and machines. Integrating AI is more than just automating business processes — it’s about assisting employees and empowering them to work smarter and be more productive. Business leaders and decision makers must think about how to build the human-machine relationship, carefully considering the division of roles, organizational structures and how to ensure that employees and AI work together to make the business and workforce thrive. These are critical problems facing every innovative business leader today. And when I consider these issues, I’m reminded of Garry Kasparov’s ideas about centaur chess. On May 11, 1997, the world’s attention was perhaps more focused on the world of chess than ever before. Why? Because on that day, Garry Kasparov–the reigning world champion–lost to a computer, IBM’s Deep Blue. Over time Kasparov, who initially accused Deep Blue of ‘cheating’, became increasingly interested in how computers could work to augment the capabilities of human chess players. He coined the term centaur chess to describe a variant of the game in which a human participant is paired with a computer that helps in decision making, including suggesting moves. In Greek mythology, centaurs were a race of creatures with the head and upper body of a man, but the legs and lower body of a horse. They combined the dexterity and intelligence of humans with the speed and stamina of horses. In Kasparov’s update, a centaur is a mixture of man and machine, with the creativity of a human and the computing power of a machine. Aficionados of centaur chess argue that the pairing of man and machine takes the game to never-before-seen levels of perfection, with blunder-free games, perfect tactical play and the flawless execution of strategic plans. Over the last 20 years, these AI systems have evolved drastically; just last month, a new program called AlphaZero is the new reigning chess champion thanks to its moves that are “unthinkable” to a human player. But the centaur chess model of human/computer collaboration has grown more relevant to the entire world of work — as AI technology moves from the lab to the business world, an entire workforce of centaurs becomes possible, enabling previously unimagined levels of productivity and performance. I’ve seen firsthand that employees are ready for the AI revolution — we’ve even done a rollout of our own AI technology to our sales teams, guiding them to better prospects and decreasing cold calls (a win for everyone!). A recent IDC report suggests that 28 percent of companies have already adopted AI, and an additional 41 percent will adopt it within two years. The reason is clear. 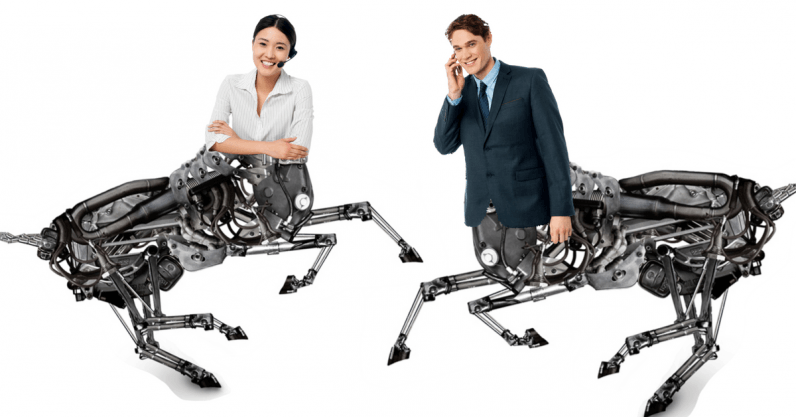 When you effectively incorporate AI into business processes, you turn the employees working on those processes into centaurs — the best of both worlds. Second, companies must ensure that not only do they have enough data to train AI algorithms — a general consensus is two years’ worth — but that the data is appropriately ‘cleaned’ and organized. This process is known as Extraction, Transformation and Loading (ETL). For now, there are tools and vendors to help with this. Over time, many expect this step to become automated. At this stage, companies should also ensure that they have the appropriate legal structures and processes in place to handle customer data appropriately. I’ve learned that the third step is the most important: securing the buy-in of your employees will make the difference between an AI rollout succeeding or failing. If customer service reps don’t trust the insights they are given from an AI-powered system, they won’t use them. If an agent feels that AI is another monitoring system or that they’ve lost control of their work to a machine, they will resist. In this context, the centaur paradigm comes in handy again. In centaur chess, the AI gives the human player advice and insight to improve their game. But the final decision to make a move always comes from the human player. I firmly believe that it’s a useful model to lean on when rolling out AI into employee workflows — not replacing humans, but arming them with the best intelligence the machine can give. As the workforce of centaurs grows, businesses will benefit from the combined forces of human creativity and intuition and the computing power of a machine. But to be truly effective, trust is needed across the board — in the technology, in business leaders, and in the training for business users — to ensure the path to an AI-enabled workforce is smooth, and to ensure we all benefit.